Keleche Osemele is one of the best offensive guard prospects in the country. His combination of size and strength is very intriguing. 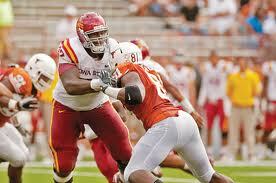 Kelechi Osemele, OT, Iowa State- Osemele impressed me tonight. He’s so big and strong that once he locks on he can drive defenders off the ball in the run game. He seems to finish blocks well and will be fine blocking interior defensive linemen because of his great size (listed at 6’6″, 345 pounds) with long arms and great strength. He doesn’t have the foot speed/lateral agility to stick at LT in the NFL in my opinion, and while he might have a shot at RT I think his upside is highest inside at guard. At that spot he is a first round pick. His long arms will help him in pass protection at guard as well, and he doesn’t seem to lean into blocks and reach in pass protection. Doesn’t bend at the waist, he bends at the knees and lets defenders come to him in his stance. He’s a quality prospect, one of the best offensive guard prospects in the country. Don’t have a report on him yet, but I will eventually. Leonard Johnson, CB, Iowa State- I can’t say enough about how well Leonard Johnson played tonight. Weeden throws the ball to Blackmon a lot, but a number of times Johnson’s blanket coverage on Blackmon forced Weeden to look at other receivers, hold onto the ball too long and at times force throws. Johnson was very good in man coverage, particularly down the sideline. He did a great job of taking away Weeden’s windows to throw to Blackmon by using the sideline to his advantage and staying right in Blackmon’s hip pocket making it nearly impossible to throw into that window. I wasn’t sure how impressed I was in zone coverage, and even in spite of his great effort mirroring Blackmon for the entire game he still gave up 10 catches for 99 yards and 1 TD. There wasn’t anything he could do about the TD, it was just a terrific play by Blackmon, but he definitely frustrated him and it was a very heated, competitive battle. Additionally, at least three or four of his catches were on screens at the line of scrimmage. Downfield Johnson had very good coverage for the majority of the game. They both seem to be very intense competitors, and while Johnson was jawing at Blackmon more and more throughout the game he never seemed to get so heated that he lost his cool. I had never specifically watched Johnson before, but he left a terrific impression on me tonight. He played great against arguably the best wide receiver in the country. Brandon Weeden was on top of many Heisman lists prior to this game, but he won't be after his relatively disappointing performance against Iowa State. 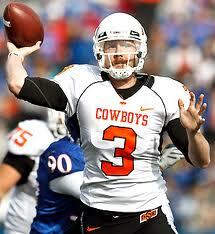 Brandon Weeden, QB, Oklahoma State- Weeden has definitely had better nights. He was checking down a lot and throwing a LOT of bubble screens which kind of bothered me. More importantly he was checking down in critical situations. He was throwing underneath and into the backfield on 3rd downs late in the fourth quarter instead of pushing the ball downfield. Now, Blackmon was well covered overall tonight and if it weren’t for some bubble screens he probably wouldn’t have had many catches, and while Moore and Cooper stepped up when Weeden got them the ball it didn’t seem like he was consistently making good reads and good decisions tonight. He didn’t come up big in crunch time when his team needed him (until he made a nice touchdown throw to Cooper in the first OT which was immediately followed by an interception on a tipped ball that was forced to Blackmon against pretty solid coverage) and that’s a problem for me when evaluating QB prospects. Considering his age, his throwing motion which could stand to be tinkered with to speed up his release, and some of his issues in this close game it’s hard for me to grade him as a 3rd round prospect right now. Justin Blackmon, WR, Oklahoma State- Blackmon had a good statistical game, but he struggled to create separation against Johnson tonight. Definitely not his best game, and while I’m not sure how many drops he had (may not have had any, but I thought I remembered at least one) he did make some nice catches extending his arms fully and had a terrific play against good man coverage by Johnson as he went up and made a great catch in mid-air as he demonstrated great body control and hands. He scored on that play, and it was definitely a highlight reel play. So while Blackmon didn’t have the best game of his career he still managed to make a couple great catches and plays to help his team. I think he could have done more, but some of that blame has to be placed on Weeden. It was encouraging to see him make plays like that, but at the same time I was hoping to see him step up late in the 4th quarter and in the overtime periods. Darius Reynolds displayed some upside in this game, and I was particularly impressed with his hand-eye coordination as well as his ability to high point the ball in the air. Darius Reynolds, WR, Iowa State- Reynolds had a pedestrian game by statistical standards with only 4 catches, 39 yards and 1 touchdown. However, I was impressed with his hands overall (though he did have at least one or two drops) as he made a great catch high pointing the ball well above the defender for his only touchdown in the first half. He almost had a second touchdown but it was ultimately ruled an incompletion. I personally believed it was a touchdown, but regardless of how it was ruled he still made a terrific play to get a hand on the ball, focus on it as he his arm was being grabbed while falling in the air and ultimately reel it in before he hit the ground. Broderick Brown stripped it out after it seemed clear to me that he had maintained control of it, but the referees ruled that there was not indisputable visual evidence to overturn the call of an incomplete pass on the field. Regardless, I had never seen Reynolds play before and he flashed some impressive ability. He’s a late round pick right now, but he flashed some upside tonight. Jared Barnett, QB, Iowa State- Barnett wasn’t overly impressive in this game statistically, but I was convinced he had poise and composure by how he was playing as the game went on. Then the 4th quarter came about and Barnett made some big time throws and plays to help move Iowa State not only within striking distance but led the comeback to tie the game. He’s a redshirt freshman quarterback but his efforts in this game were very impressive. They weren’t all pretty, but he came up big when his team needed him to. A.J. Klein, LB, Iowa State- Klein is a junior linebacker on Iowa State that impressed me tonight. He seemed to be a reliable tackler, showed some ability in coverage by deflecting a pass or two, and seemed to be around the ball consistently in this game. I’d grade him as a 3rd-4th rounder for the 2013 class as he has some ability, but haven’t seen enough of him yet and I don’t think he’s an elite athlete. I liked what I saw from him tonight though. Markelle Martin, S, Oklahoma State- Martin is an athletic player and he had a couple nice plays in coverage tonight. He missed some tackles early in the game and overall I think he earned mixed reviews in this game. He’s an athletic specimen, but I don’t know how high I am on him at this point. Hopefully you enjoyed my thoughts on the Oklahoma State-Iowa State game. It was sloppy at times, but overall it was a fantastic game and a huge upset. It was definitely a very fun game to watch, and it had a number of legitimate NFL prospects to take a look at. Thanks for reading! Analysis: Osemele is an offensive tackle at Iowa State I believe but I don’t think he will stick at LT in the NFL so I think he will be a RT or an OG based off of what little I have seen of him. I am interested to watch him more to see if I think he for sure has to be a guard or if I think he can stick at one of the tackle positions. Analysis: Zeitler was part of a very talented offensive line at Wisconsin and it’s hard not to like Wisconsin offensive linemen because they churn out some good ones. I am excited to see him play because I obviously paid more attention to Carimi and Moffitt when I was scouting last year. Analysis: Stanford is another team that has a good offensive line and they are powerful, so I am interested to see what DeCastro has as a blocker in the run game and as a pass blocker. Analysis: Glenn is a very big offensive lineman that might play offensive tackle for the Bulldogs but I am not sure. I haven’t paid specific attention to him when I watched Georgia but at his size he would be a very imposing offensive guard. I just question how much lateral agility he could have to stick at tackle if that is his position. I am looking forward to getting a chance to evaluate him further this year. Analysis: Good is a quality guard prospect and while I haven’t scouted him specifically I think he warrants this top five ranking. He might end up being ranked higher than this as the year progresses. Good will definitely get a chance to demonstrate his pass blocking ability as Oklahoma figures to be passing the ball a lot, but I am interested to evaluate him as a run and pass blocker this season. Analysis: Watkins is going to be paving the way for one of the best running backs in the nation in Marcus Lattimore so I would not be surprised if we got to see him run blocking very frequently, especially with relative uncertainty at the QB position even if Stephen Garcia ends up being the starter. I haven’t paid attention to him before when watching South Carolina though, so I will have to do that this year. Analysis: Washington may only be a junior but he is going to be on a very talented Miami team this season, and while I haven’t scouted him specifically I have pretty high expectations for him given what I have read about him and what little I have seen of him. Analysis: Jacobson helped pave the way for a very successful rushing attack the past couple of years, but the passing attack has been lackluster. I don’t know much about his ability as a run or pass blocker, but I will find out as soon as I get to watch him more this season. Analysis: Brooks is left on a Kentucky team that lost a boatload of talent to the draft, most notably Randall Cobb, Derrick Locke, Mike Hartline and Chris Matthews. However, they have some returning talent, especially at running back, and it will be up to Brooks to help give them some running room this season. Analysis: Jones will be playing on a team that lost a lot of talent to the NFL as well, but Alabama has become one of the powers that doesn’t rebuild, it just reloads. It will be interesting to see how much of a passing attack they can generate without McElroy and Julio Jones, but Jones will be busy run blocking for Trent Richardson this season to be sure. 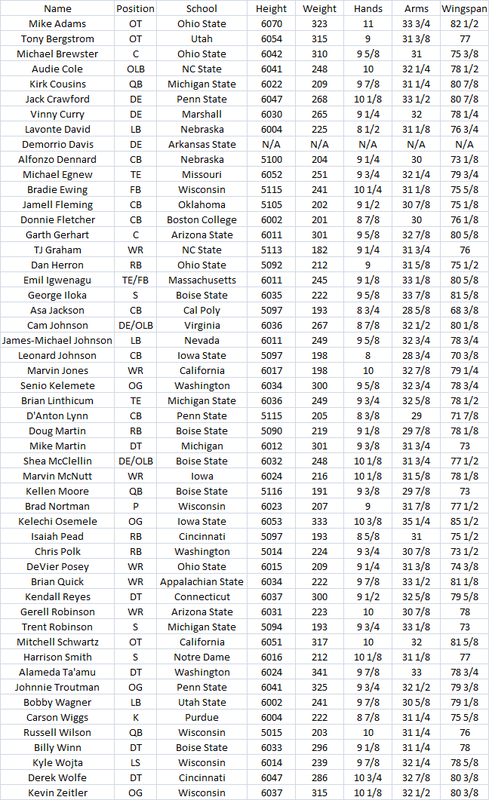 Hopefully you enjoyed my preliminary break-down on the top offensive guards in this 2012 Draft Class. Thanks for reading!